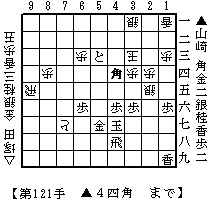 On May 21, 2006, NHK(Japan Broadcasting Corp.) aired Tsukada 9dan vs Yamazaki 6dan and the game was ended with Miyakozume(Mate in the capital) which is very rare in a real game. In Tsumeshogi, Miyakozume is one of the themes of creation. Miyako means the capital. 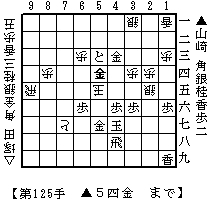 Since the square of 5e is the very center of the shogi board which is associated with the capital, a mated King on 5e is called Miyakozume. The real proceeding of the game was like this. S*2e prevented Gote's King from being mated to begin with Sx3d+ only. So Gote's King should have been mated to begin with Sx3b=. But because of Gote's pawn sacrifice of P-5g+, Sente got a refreshing sequence with Bishop sacrifice to mate Gote's King. After the second diagram, the real proceeding was like this. Without Gote's pawn sacrifice of P-5g+, Sente's Gold should have stayed on 5h and Sente's pawn on 6f should have been floating. This impressive Bishop sacrifice should have been impossible without it. After the 3rd diagram, the real proceeding was like this. Yamazaki won the game with 125 moves at the 4th diagram. 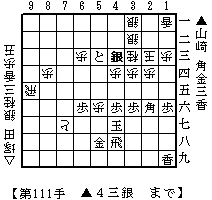 Tsukada did not resign until his king was mated on 5e. Professional players usually resign a game several moves before their King is mated. I think Tsukada intended to show Miyakozume on TV when he saw he had no hope to win the game around the first diagram and that's why he sacrificed his pawn by P-5g+ which enabled for Gote's King to be mated on 5e. I thought only Segawa 4dan who used be an ama player beat the said level of pro player. He won a game of Gingasen against Kubo 8dan when he was an ama. in all of the shogi hands that i have seen there is only one with the 玉 and this is the shogi play whom plays sente the gote player has only the 王.
in the above site that you have directed us to the shogi playing board has 玉 for both sides. Thomas, thanks for your comment. Since I'm not a historian, I do not know much about the origin of 王、玉. But I just like to point out the fact that both 玉　are used in almost all shogi diagrams in paper medium such as books, magazines and newspapers in Japan.